Waiouru: Hello Huston…. We might have a slight problem! A slightly later start to the day and an easy run down to Hall Green Stop Lock where the Macclesfield and Trent & Mersey Canals meet. 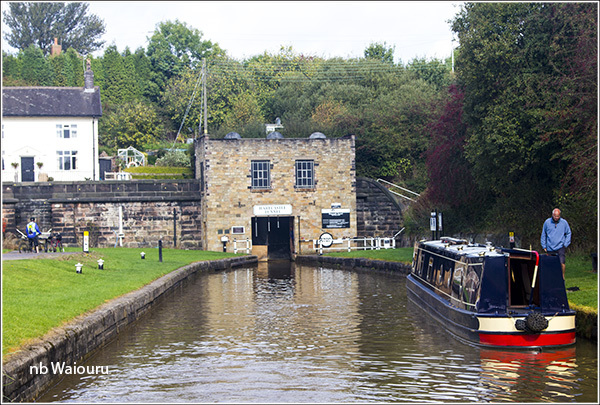 Paul (nb Waterway Routes) left a comment on an earlier post regarding the history of this lock. He also blogged about it here. Wikipedia also mentions the history of the lock <link here>. 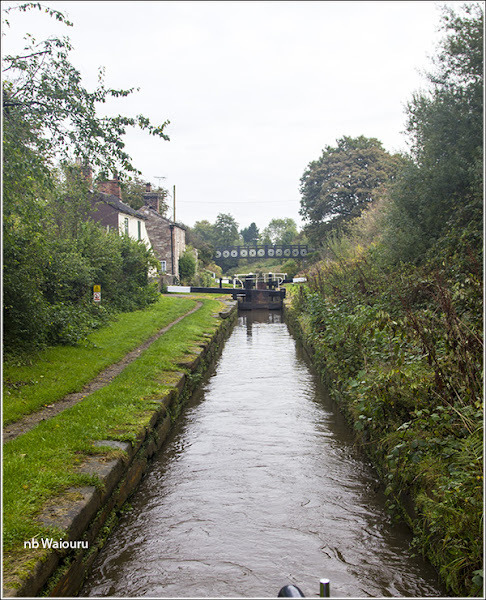 The Trent & Mersey Canal Company built the Hall Green Branch out to meet the new Macclesfield Canal. 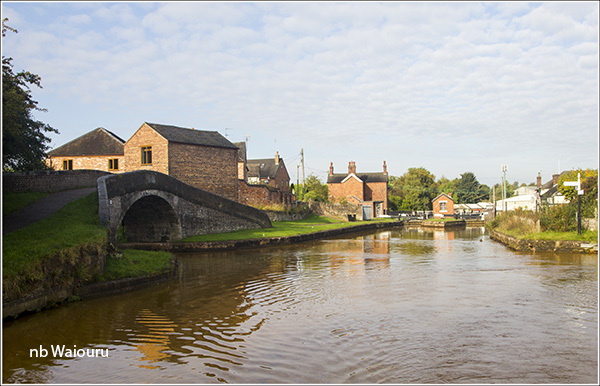 Both canal companies wanted to preserve their water and two locks were built at Hall Green. This allowed either canal to be higher and protected each canal’s water. One lock chamber was eventually removed but the narrows can still be seen. The water level on the T&M side was permanently lowered 6 inches after the canals were nationalized. This was done to increase the air draught in the Harecastle Tunnel as it was subsiding (and apparently still is). There is a sharp left turn at Red Bull and then a narrow section of canal to Hardings Wood Junction. Of course this had to be the location for us to pass one of the only two moving boats we saw today. Left turn for the Macclesfield Canal. We had a quick trip through the tunnel (30 minutes). I must mention the pre-departure safety briefing which was even more comprehensive than the one we received last year. One assumes this is one consequence of the recent fatality in the tunnel. That’s the last of Harecastle Tunnel for this year. 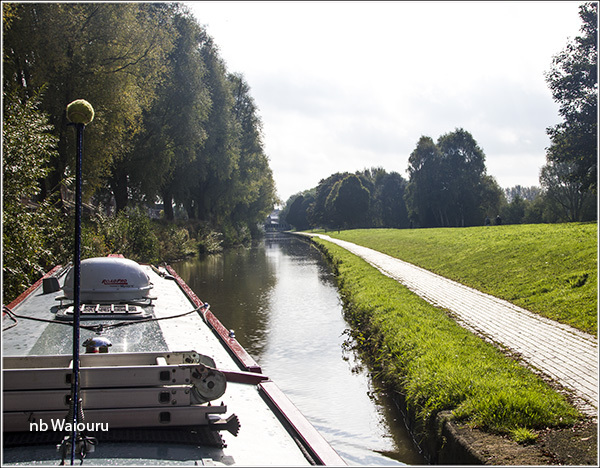 The stretch of canal from the tunnel to Etruria was very quiet and we were very surprised to see the moorings beside the lake at Longbridge completely empty. We’ve never seen it like this during any of our previous cruises. The blind bend at bridge 118 can be an issue so we slowed down. Just as well we did because a hire boat appeared from the opposite direction in the process of making the jump to light speed. I went into hard reverse and got the bow against the right bank. He didn’t attempt to slow down and roared around us refusing to make eye contact. I’d have liked to have shouted a few words but contented myself by thinking that he probably doesn’t know who is father is. At Etruria Junction we turned onto the Caldon Canal and winded so we could moor on the 48 hour moorings adjacent to the water point. Jan hung out all our unmentionables on the stern whilst I attempted to repair the external hard drive docking station. It gets dragged out of storage every six months to backup the AV data to the “daughter” hard drives. The on/off switch has decided to work intermittently so I needed to strip it down and see if it could be repaired. Baseplate off and view of innards. The arrow points to the switch. 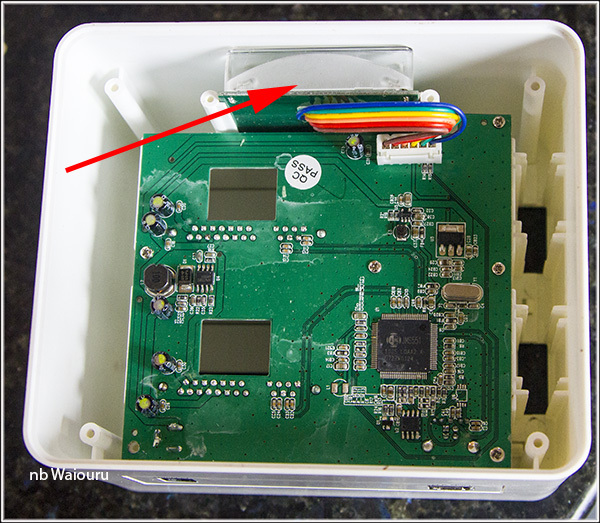 I removed the printed circuit board to access the switch only to find it’s a sealed unit. I actually managed to make the switch work and then reassembled the unit only to discover it sometimes doesn’t work. Using it twice a year means I’m not going to replace it. Later in the afternoon I donned my blue onesie and slipped down into the sauna to do a major service on the big noisy green thing that lives there. More waste oil to dispose of. Now for our little problem. Over the past few weeks we have both noticed the engine will suddenly loose power only to recover several minutes later. I assumed (or wanted to believe) this was the Sterling Pro-Digital Advanced Regulator (PDAR) cutting in and out forcing the 175A alternator to deliver more electricity to the domestic battery bank. However today we noticed that on starting the engine instead of 140-160 amps going into the battery bank there was 20-30 amps. The Smartgauge was reading 62% charged so the alternator should have been working hard to complete the Bulk charge. Waiouru has a SmartBank Advanced battery management system. This ensures the starter battery is fully charged by the 50A alternator and once this has occurred it combines to output from the two alternators (50A & 175A) to recharge the domestic battery bank. We also have a Sterling PDAR connected to the 175A alternator. This forces the alternator to increase it’s voltage output which further speeds up the recharging of the domestic batteries. With only 20-30 amps going into the domestic batteries it looked like the 175A alternator might have failed. It does have to work hard so I wouldn’t be surprised if it had failed. On looking at the LEDs on the PDAR I could see the Hi Charge LED wasn’t illuminated, yet the batteries were in need of a bulk charge. I turned the engine off and waited 10 minutes before turning it back on. The Hi Charge LED illuminated for a minute and then went out. It appears we may have a failing alternator. Fortunately we have the smaller alternator which is producing 20-30A and we also have the 240v suitcase generator whilst we source a replacement for the alternator. As you know alternators were the bane of my life when we were able to use KL. Many people commented that it was the PDAR at the bottom of it, but I persevered with it throughout. We still managed to destroy 2 alternators in 5 years though. People seem to love them or hate them. A spare alternator has always been carried aboard... Ho hum, with our new engine it is something I need to do.. I don't have a spare for this new one! Gone straight on the 'Don't forget to Do List'! I'm not convinced we need a spare alternator. There are two on the engine and we also have the generator.